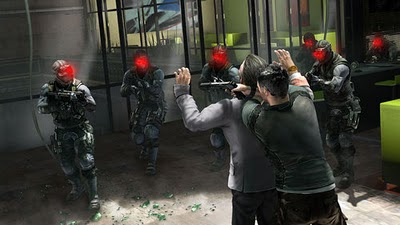 I just caught wind that Future Shop will be having an autograph signing session with the team behind Splinter Cell: Conviction on Tuesday, April 13 at the Centreville store location (460, Rue Sainte-Catherine Ouest) from 10:00 a.m. - 1:00 p.m. EST. The first 100 customers in line will receive an autographed Splinter Cell: Conviction poster. The development team at the signing consists of Patrick Redding (Game Director, Co-op), Alexandre Parizeau (Producer), Maxime Beland (Creative Director), and Steven Masters (Lead Game Designer). Of course, the timing is aligned with the release date of Splinter Cell: Conviction on the Xbox 360. If you're thinking of picking up the game on opening day, you could turn your regular edition into a signed edition, or your collector's edition into an elite collector's edition. There's even a 360 bundle available -- imagine how cool it would be to get that signed. The PC version has unfortunately been delayed by two weeks, so if you don't own an Xbox 360 you're out of luck, at least if you want an autographed copy. Gonna Be In Vancouver Soon?